That’ll be great, but any plans on the upcoming Windows 8 and also WP7? Windows 8 is a desktop operating system and I would think regular access to a browser bookmark would be sufficient for most. 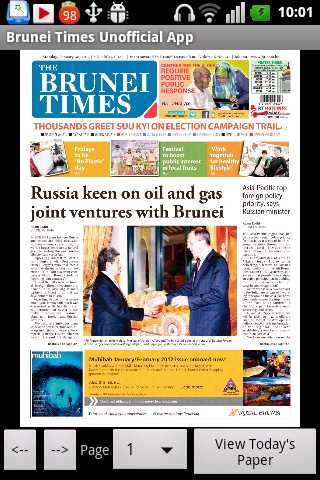 Alternatively there is always my Brunei Times E-Paper downloader. With regards to Windows Phone 7, asides from not having a Windows Phone, I don’t really use Windows and thus the development tools are not really available for Linux and OS X which I use. I guess work could be done in a virtual machine but I would be less than ideal. Also I’m not sure if Windows Phone 7 allows packaging of apps outside their Market. I’ve heard of home brew but I’m not sure if it allows distributable installers. This is the reason I love Android: the development tools are available on all platforms and you can pass an apk installer to anybody who can then install it as long as they make some changes in their settings. Thanks for the feedback =) I could make this a setting in the future. You can actually go to /sdcard/Pictures/bt/ folder and delete older downloaded images if you wish.